Are you ever harassed by the annoying door-to-door salesmen? Or are you caught in their door-to-door scams before you realize? Truth is, if you don’t know how to identify door to door scams, the chances of being scammed could be pretty high. Today I would like to share how door to door sales scams work, common types of door to door scams in 2017 and 2018 and the smart ways about how to avoid them. It’s my hope that this post will help you better deal with the door-to-door scams and that you may share with us some useful tips of your own! In typical door to door scams, the door to door fraudsters would disguise themselves as employees with uniforms and badges, or college students doing part-time jobs to earn the tuition fees. Their real aim, however, is to convince you into buying their products or service you actually don’t need. Or worse, the door to door salesman burglars may try to distract your attention so that their conspirators can sneak into your house to steal from you. 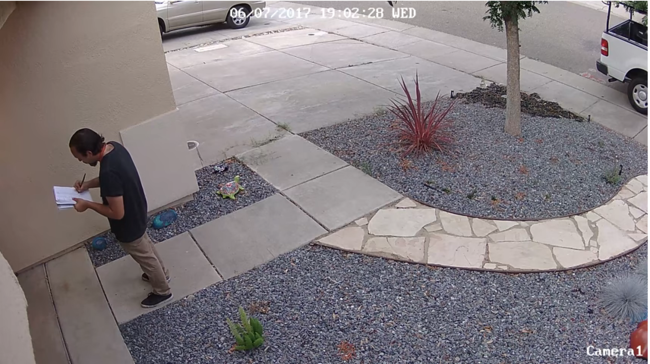 Below is a door to door gas scam captured by the Reolink security system. And watch out: the main targets of door to door sales scams, like door to door cleaning products scams, are people aged 50 and above. As these retirement-age folks are more likely to be at home to answer the door during the daytime. And their polite manners make it hard to for them to slam the door in front of door to door fraudsters. To help you better identify door to door scams, take a few minutes to look through the typical examples of door to door salesman scams. Below is a list of the popular door to door sales scams in Las Vegas, Ireland, UK, Australia, Ottawa, Vancouver, Winnipeg, Edmonton, New Zealand, etc. Stay vigilant if you are confronted with such scenarios. Door to Door Meat Scams: The complaints about door to door meat sales scams are not rare in America each summer. Typically the meat is of inferior quality, and marked up significantly. You may be even poisoned after eating the meat. Door to Door Donation Scams: Someone comes to your front door and seek for donations in certain organizations’ name, such as the Hope Center. It is also a common kind of door to door charity scams. Door to Door Art Scams: A group of young people, claiming to be international art students, tell you that they are trying to raise funds for their tuition and art supplies by selling their own piece. Door to Door Survey Scams: The door to door fraudsters knock on your door and claim to be taking a survey for an election or wellness checks. The door to door census scams are just the typical examples. Door to Door Home Maintenance Scams: Whether the door to door salesmen offer free roof repairs or free carpet cleaning, they might simple look for a chance to case your house.Don’t fall into these door to door roofing scams, free carpet cleaning scams, tree service scams or vacuum cleaner scams. Besides these common door to door sales scams, you should also watch out for the Verizon door to door scams, door to door book sales scams, door to door magazine subscription scams, door to door insurance scams and more. Imagine this: a door to door salesman burglar rings your doorbell without appointment, your sleeping baby starts crying and your dog doesn’t stop barking. Perhaps this is the most annoying thing of your day! Luckily, though, you can take these tips to stop the door to door salesmen from knocking your door and thus avoid the door to door sales scams. How many times do you regret for opening the door for someone you don’t expect, especially like the door to door salesmen selling cleaning products or other service. With a security camera at your front door, the odds of falling for door to door scams can be much slimmer. When someone like a door to door salesman burglar enters the monitoring area, you can receive real-time alerts on your mobile devices. Before the salesperson knocks on your door, you can tell him to leave via the two-way audio security cameras even when you are not at home. In this way, you can also shut off all possible door to door sales scams, like door to door pest control scams or home security scams outside your door. 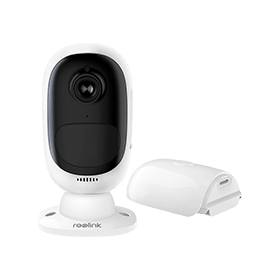 Watch the watch video below to see how you can inform the delivery man to drop off the package on your doorway via Reolink Argus® 2. The quick method to avoid door to door salesman scams is to deliver the message clearly that you are not interested in their products or service. And putting up the following signs may work for you. You can buy these signs on the Amazon store and they are quite cheap. Making them by yourself is also not that difficult if you are a handcraft lover. Do remember to place the signs on the conspicuous positions where they are plainly visible, such as the doorway or walkway, so that the door to door salesmen can easily spot them. In both Las Vegas and Henderson, it is unlawful for a door-to-door salesperson to attempt to sell you something if you’ve posted a “No Soliciting” sign. Takeaway: Read this to learn whether it is illegal for door to door salesmen to ignore your “No Soliciting” sign. 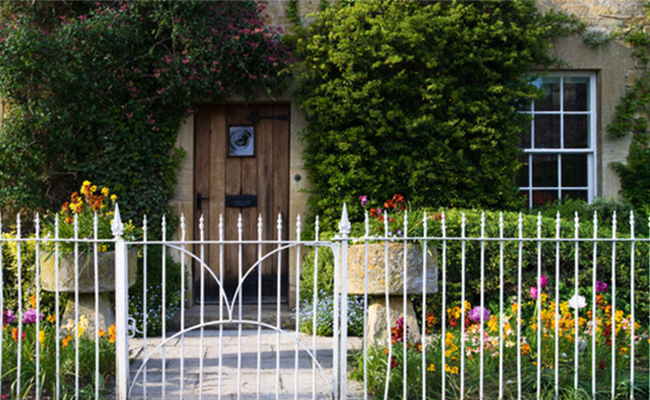 A gate or fence can effectively avoid door to door scams by preventing door to door fraudsters from getting to your door or doorbell. So if your home has a gate or have put up a fence, you will have little chance to be troubled by the door to door salesmen or fall for the door to door sales scams. Bonus: Putting up fences is also a good way to keep the trespassing kids off your property when you are away. If you search door to door sales scams online, you would be lost in massive door to door complaints about the AT&T door to door scams, ADT door to door scams, Centurylink door to door scams, Verizon door to door scams, Directv door to door scams, Kirby vacuum door to door sales scams, Telus door to door scams and the like. So how can you avoid becoming the next target of such door to door scams if you open the door for a salesman? Now learn the following tips to outsmart the door to door fraudsters. The burglars disguised as door to door salesmen won’t bypass your home even you put up the signs. In such cases, be ready to refuse decisively before you open the door. The more time you give to the door to door salesmen to speak, the more likely you will end up in door to door sales scams. Alternatively, you can find some good excuses to avoid the door to door scams, like painting or marketing scams. For example, it is pretty common to say you were cooking Tempura, which is notorious for needing constant attention during the cooking process, so no one would think you rude for being brisk. Some door to door salesman burglars may not lure you into the door to door water heater scams, door to door children’s book scams, candy sales scam or door to door alarm scams. Instead, they might try to enter your house and look around your home for the next-time burglary. Don’t let the salesmen in especially you are at home alone. Shut the door or call the local police if you feel the door to door salesmen are crossing the line. Some door to door salesmen are good at selling their ideas and you may be lost in their door to door sales scams like energy scams or fundraising scams within minutes. How can you avoid such disadvantage situation? Hold the cards by asking more detailed questions about the identity of the salesperson. For example, ask him to show you his ID card and license, learn more about his company information, such as the location, phone number, and etc. Though it is best not to engage with door to door sales, if you really need the door to door products or service, well, then remember not to pay in cash. Normally, the legitimate door-to-door sellers should provide you with a cancellation form along with the receipt. If they don’t, assume you’ve been marked for a door to door sales scam. Notice that the FTC’s Cooling-Off Rule allow you to cancel a sale made at your home within 3 business days and you can get a full refund on most purchases of $25 or more. One of the common door to door scams is that you may be offered with contract files with many hidden fees. To avoid the buyer’s remorse, give yourself enough time to read the documents thoroughly and make sure you understand each terms fully. You may ask the door to door salesman to leave the document and call him back after mature consideration. Never sign any agreement when you feel pressured to do so. If you feel you have become victims of certain door to door sales scams, contact your local police immediately and file a door to door scam complaint with the Federal Trade Commission. Tape up or silence your doorbell to stay away from door to door scams in Tuscon, Victoria, Fresco and other places. Tell the door to door salesmen that you’re a renter rather than the homeowner. To prevent falling into door to door charity scams, for example, in UK, check and see if the door to door salesperson have charity permits. Many cities tax door to door non-profits and require that they have a permit from the city. Use a peep hole or a window to see who is at the door prior to opening it. Don’t answer your door unless the visit is pre-arranged. Make the door to door salesmen wait outside your doorway, and you can contact their company to check their identities. Do remember that the door to door sales are so not so urgent that you need to make the decision at once. If you are interested in the door to door salesman’s product, ask him to leave the information and return later so that you have enough time to check his credentials. But the 101 rule to avoid most common door to door scams is never to do business with a door to door salesperson and keep your door locked even when you are at home. If you find yourself cheated by AT&T Uverse door to door scams, dish network door to door scams, door to door furnace scams or other forms of scams, don’t hesitate to report the door to door sales scams immediately to the police. This entry was posted in Home Security FAQs and tagged door-to-door scam. Someone came to my mother’s door selling life insurance. Ordinarily she is very cautious about opening the door to strangers and always looks out the front window first. But this time she wasn’t wearing her glasses and mistook her caller for the postman. Thinking he had a registered letter or package requiring her signature — although she wasn’t expecting one — she opened the door. Now my mother is a polite Southerner with impeccable manners — most of the time. The rest of the time she is meaner than a junkyard dog! She screamed at the man to leave her the eff alone or she’d call the police. She continued yelling at him as he left her property. Was he a scammer? We don’t know. She saw him to go the next house and apparently get sent away, and then he turned the corner, out of her sight.